Climate Priorities 2019 focused on issues related to measurement and modeling of the earth’s climate: temperature measurement, climate sensitivity, forcings and feedbacks, and, model verification. These issues are a priority for 2019, but they have been a priority for decades without resolution. However, they are hardly the only unresolved or poorly understood issues in climate science. The oceans cover approximately 70% of the surface of the planet. There are several natural ocean phenomena which have significant effects on weather and climate which are known but not well understood. 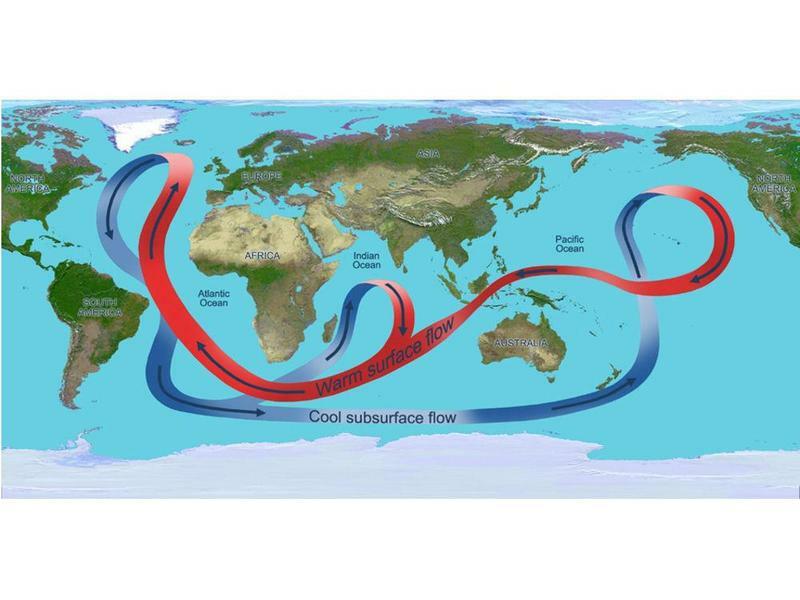 On a global scale, the Global Ocean Conveyor Belt (GOCB) circulates water among the world’s oceans. While scientists are aware that the GOCB exists, there is less certainty about why; and, about how its existence influences climate globally. 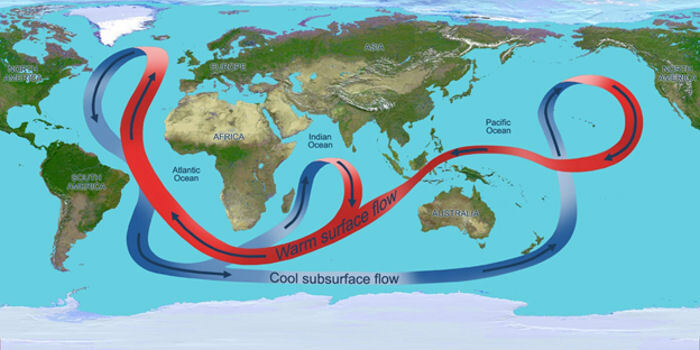 Perhaps the best-known component of the GOCB is the Gulf Stream, which is one of the streams which compose the Atlantic Meridional Overturning Circulation. There are numerous other regional currents which also have weather and climate effects in the various ocean basins. These regional phenomena occur over very different time frames. The El Nino Southern Oscillation consists of two relatively short-lived phenomena (1-2 year duration). The warm phenomena are referred to as El Ninos, while the cool phenomena are referred to as La Nina. The timing of the ENSO phenomena are not highly predictable and their magnitudes vary considerably, as do their effects on climate. 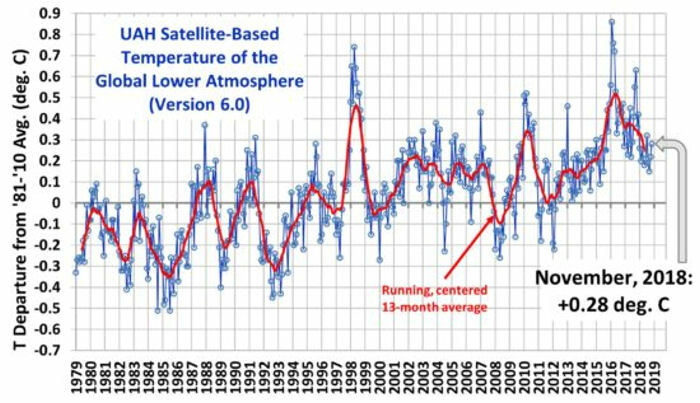 The graph of global lower atmosphere temperatures above illustrates the climate effects of ENSO events, among other things, highlighted by two Super El Ninos in 1997-1998 and 2016/2017. The factors which trigger ENSO events and determine their intensity are not well understood, but the events have significant weather effects and arguably might have significant climate effects as well. The PDO is a longer-term phenomenon, with an estimated period of 20-30 years for both its warm phase and its cool phase. The impacts of the phases and the phase change on weather and climate are not well understood, nor is their interaction with ENSO events in the Pacific Basin. The AMO is an even longer term phenomenon, with an estimated period of 60-80 years for both its warm phase and its cool phase. The impacts of the phases and the phase change are even less well understood than for the PDO, because the period of the phases is so long that perhaps only a single phase change has been subjected to instrumental measurement. Understanding the factors which cause these phenomena and the effects of these individual phenomena and their interactions are a major scientific challenge. Once these phenomena are well understood, they can be modeled and included in the global climate models, so that their effects can be included in the modeled scenarios. Until that is the case, their absence represents a significant limitation to the accuracy and thus the utility of the climate models. Thank you for visiting https://www.therightinsight.org:443/More-Climate-Issues-2019! Be sure and revisit therightinsight.org frequently for content updates and more.